Family and friends have gathered at Pemberley for the much anticipated wedding of Kitty Bennet to Mr. Winkler. All the fine wedding particulars of flowers, tasty food and good wine are discussed and supervised by the Mistress of Pemberley, our dear Elizabeth Darcy. So far, a happy and pleasant story. But, things soon turn ugly (that’s an understatement). While Georgiana (a married woman now) prepares for a romantic rendezvous with her husband, unconfirmed news has arrived that he (Major General Fitzwilliam) has, in fact, been killed in action. Lydia arrives with Wickham (who is as unwelcome as ever), and page-by-page the festive feeling loses ground to a darker, more sinister feeling as several subplots begin to evolve outside the grounds of Pemberley. Moving the setting from the light of Pemberley to the darkness of the Scottish moors was helpful to me as a reader. To me, Pemberley represents happiness, prosperity, and goodness. Once the characters are outside the gates of Pemberley (and their own comfort zones), they are in uncontrolled and untamed territory. Pemberley may have expansive grounds…but you can’t get lost there. The consistent attention paid to the moors (Yorkshire) in Emily Brontë’s Wuthering Heights was no accident. More than a handful of English majors have discussed the relationship between Heathcliff and Catherine and their moor-like existence. Settings and landscapes can subliminally add depth to any story. 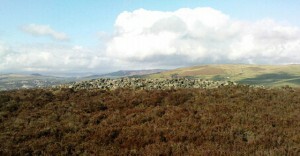 The moors symbolize wilderness, and emptiness. Nothing can really grow there. Even the air hints of loneliness. Sir Arthur Conan Doyle used the inhospitable terrain for his backdrop in The Hound of the Baskervilles. Fog and wind can change the mood of any good story. In this month’s DJABC’s pick, darkness hangs between our favorite (and passionate) characters (Darcy and Elizabeth) as they set off from their luxurious estate to bleaker settings in Regina Jeffers’ The Disappearance of Georgiana Darcy. It’s an Austen-esque mystery that mixes the majesty of Pemberley with the eeriness of cellars, a castle, and the cruel miscreants that reside within the walls of Normanna Hall (a stark contrast to the bliss of Pemberley where cute little Darcy babies sleep soundly in their cradles).